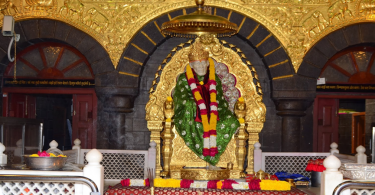 Shirdi Arati Darshan Timings and Aarti Schedule. It includes 4 different Aarti schedule like Kakad Aarti, Madhyan, Dhoop & Shej Aarti timings & Schedule – Arati dispels darkness in life. So does the subdued importance of lamp lighting really mean to people worshipping God and meditating to seek blessings day in and day out, as it takes place when you are on the Shirdi Sai darshan. There are Aartis being attended by no less than thousands of darshanarthees at a time. While their graceful visit is becoming easier with Online Darshan Booking as you are able to book ticket for one or all Aartis/Aratis. Without much hassle being faced puja and aartis in Shirdi are attended. It’s simple and easy. Furthermore, for the devotees’ convenience, the Shirdi Sai Sansthan Trust has begun online ticketing system. It’s much useful for darshananrthees (devotees or bhaktas) to be present as per the given Shirdi Aarti Schedule and pay their gracious respect. It saves a lot of time. Once you get registered, you stay away from standing in long queues. Most of all Devotees reach Samadhi Temple just about the given time and pay their respect. Predominantly, 4 famous Aartis are organized. These glowing lamp-lighting ceremonies are the bona fide cynosure of Samadhi Mandir in particular. Their timings are also available online. 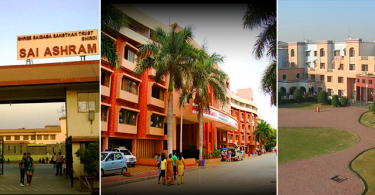 Special Shirdi darshan for Government Employees and VIP passes are obtainable from P.R.O. (Public Relation Office) located nearby the temple. Therefore, Devotees can check out before booking. The temple opens at 04:00a.m. when the very first Aarti begins. Moved by Baba’s adoration and affection, a huge people’s flow ever pours in to take a look of Baba’s first sight. Devotees start making queue right from the midnight. Special Aarti Day & Timings – In addition to above aarti schedule, Every Thursday, Baba’s palkhi (Palanquin) procession takes place. It starts at 9:15 p.m. from Samadhi Mandir. All above mentioned aartis are parts of Sai Puja. Ghee (purified butter) soaked wicks are lighted with camphor. The Sai aartis are done with energy giving devotional songs. This unanimous chanting makes the aura completely reverberating and synchronizes mind and body together to give cosmic vibes, and consequently considered to have secured blissful benediction flow of Sai kripa. If you have any query on Shirdi Aarti Timings & Booking, please leave your comment below, we will get back to you at the earliest. I am planning to visit Shirdi Sai Baba Temple on Dussehra 2017. Can you tell me the important events or programmes that are being celebrated on eve of Vijayadashami ? Dussehra or VijayaDashami is observed every year as Shirdi Sai Baba Punyatithi to mark Mahasamadhi day of Shirdi Sai Baba. On this day ‘Brahman Bhojan’ is arranged with Dakashina (Donation to Guru). Important event on the last day of the festival “Sgavjewan” ( free meal for all village People and devotees is given by Shri Saibaba Sansthan Trust,Shirdi). 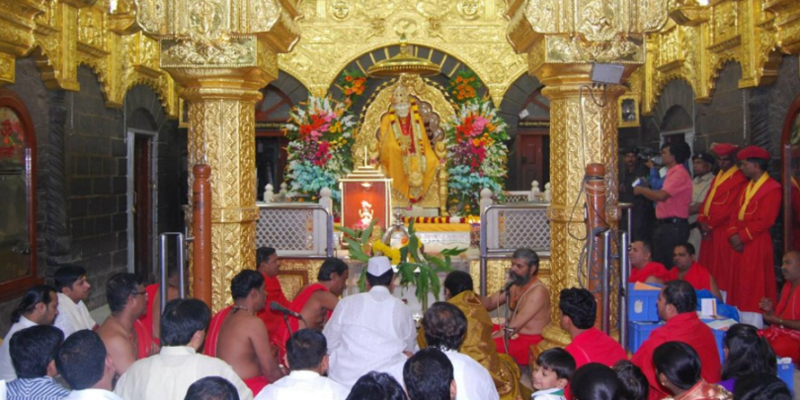 Samadhi Mandir will remain open for Parayan throughout the night on the Shirdi Sai Baba Punyatithi day. Shri Punyatithi on Dussehra or VijayaDashami day will be celebrated this year from 29 September 2017 to 02 October 2017. Its very challenging to book it online at this short notice, however, you may visit or call PRO office directly to get the tickets. We want to book arati tickets online. However, since we will be travelling, dont know, what time we should be present in the temple premises to queue up for arati. For eg, if we book dhoop arati, which is performed 4.30pm to 5.30pm (as per online booking), what time we should report to the temple premises (30mins before or 1hr before or earlier than that)?? For Dhoop Arati, it advisable to reach 45 minutes before the start. Generally, Dhoop Arati is performed 20 minutes before sunset. Nowadays, sunset timings are 6:30 PM so please make it between 5 pm to 5:15 pm. Thanks for the reply. Sorry, forgot to mention, we will be visiting in Nov (mostly winter I suppose) may be sunset would be much earlier. So, may be its better to be there by 4;30pm? Besides, the booking slot is 4.30 to 5.30pm in the online booking. So, its it like we must be present 45mins before 4.30pm? Sorry, for my confusion, but it should not happen like we reach at 5 (because sunset is at 6:30pm) and we are not allowed inside. We (myself and my husband) plan to see Dhoop Arti on 21/01/2018 and also want to book it online. Please help me to book it. As of now the Shirdi Sai Baba Dhoop Aarti can be booked till 11th Dec 2017. For booking 21/01/2018 Dhoop aarti you should try after 3 to 4 weeks time. The cost of Dhoop Aarti per person amount is Rs 400. Sir, the check time for online booking in Dwarawati is 11 am and also check out time is 11 am. You can only request them for early check in and they will allot you rooms if rooms are vacant. And for Dhoop Arati, it advisable to reach 30 to 45 minutes before the start. So, it will be fine if you reach till 4 pm. sir i want to come for madhyan aarti ,we are 2 people.am unable to book it online.please help. Madam can you tell me for which date you want to book Madhyan Aarti . As you can book for Kakad, Madhyan, Dhoop & Shej Aarti online from 20th Nov onwards. Yes Sir wheel chairs are provided by the Sansthan for disabled/senior citizens absolutely free of cost. You can get the wheel chair by contacting the PRO office counter available at Shirdi Sai Temple. Madam are you looking for Shirdi Shej Aarti Timings & Schedule with Tickets information.Please tell me the date of arrival. Dear Subbaratnam, Kakad Arti time starts from 4:30 AM and one can queue up for it from 4 AM. Normally it’s not a problem if u change at last minute. However, it’s always advisable to check with PRO office before visiting the lord. I have to book for Aarti Darshan through Online process but I am not able to book it. Can you provide me link where I can book it as we are visiting there on 17th-18th September.